If you are using Internet Explorer to view this page you are probably wondering why anyone would leave the margins misaligned, or why the fonts don’t look right. I have tried a number of things to remedy these problems, but all attempts have proven unsuccessful. If you know what might be the problem, please let me know. 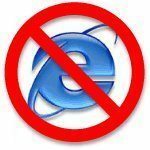 If you are using any other browser (Firefox, Netscape, Safari, Opera, etc.) you will have no idea what I’m writing about, because your browser is rendering the page correctly.